Throughout its storied history, USC has placed a high value on being a good neighbor—and on programs and projects that have a positive impact on surrounding neighborhoods. Over the decades, we have come together with local residents, community partners, civic leaders, and area businesses in one of the most ambitious social-outreach programs of any university in the nation. In the early 1870s, when Los Angeles was a rough-and-tumble frontier town with a population of 10,000, a group of public-spirited citizens dreamed of establishing a university in the region. It took nearly a decade for that vision to become reality, and when USC first opened its doors, there were 53 students and 10 professors. Today, the university is home to some 38,000 students and 23,000 faculty and staff, who carry on a tradition of active engagement with the community. USC has remained committed to its original University Park neighborhood as well as to its Boyle Heights/Lincoln Heights neighborhood, home of the Health Sciences campus since its opening in 1952. Both areas are among the most culturally vibrant and historically significant in the city, and both areas are integral to the identity of our university. Our commitment to community-building can be seen at every level of the university. It encompasses the participation of our research facilities, individual schools, departments, and programs, as well as our hospitals and health centers. 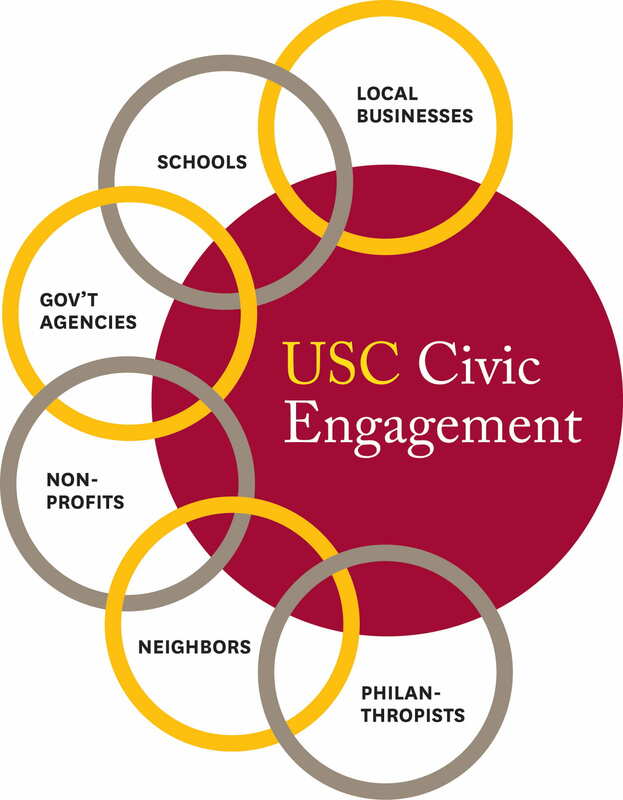 USC Civic Engagement supports and promotes more than 400 community initiatives in our local neighborhoods. As an institution, we are committed to helping young people realize their dream of a college education. We are striving to assist families and small businesses in gaining access to resources that support their health and vitality. We are proud to protect, develop, and cherish our neighborhood communities. The USC SCHOOL FOR EARLY CHILDHOOD EDUCATION (SECE) is founded to provide comprehensive, high-quality early childhood education services to low-income children and families in the neighborhoods surrounding the University Park campus. The operation is funded by a combination of federal and state grants. The federally funded TRiO PROGRAM UPWARD BOUND was created to motivate and support low-income and first-generation minority students in progressing through the academic pipeline from middle school through college. Currently, USC TRiO includes three Upward Bound programs, one Upward Bound Math-Science program and two Educational Talent Search programs. Recognizing changes in the neighborhood, President James H. Zumberge appointed a task force to evaluate community relations. This group became the new office of CIVIC AND COMMUNITY RELATIONS, the early model of the current USC Civic Engagement. The USC NEIGHBORHOOD ACADEMIC INITIATIVE (NAI) accepts its first cadre of students. The program now boasts a 100-percent high school graduation rate among participants. Among the nearly 500 students who have graduated from NAI since 1997, 99 percent have been accepted at institutions of higher education. In response to the L.A. riots, President Steven Sample embraces FIVE UNIVERSITY-COMMUNITY INITIATIVES aimed at focusing the university‚Äôs outreach and public-service programs on making a visible difference in the neighborhoods surrounding its two campuses. These five initiatives still power the efforts of Civic Engagement today. The USC GOOD NEIGHBORS CAMPAIGN is launched. The program asks university faculty and staff to contribute a portion of their paychecks to support efforts that help strengthen local communities. Over the years, students, alumni, and friends have joined in. The USC FAMILY OF SCHOOLS began as a partnership with five public schools near the University Park campus. Today, it provides educational, cultural, and developmental opportunities to more than 17,000 children in 15 schools surrounding the University Park and Health Sciences campuses. USC NEIGHBORHOOD OUTREACH (UNO) issues its first request for proposals in January. Since then, UNO grants have funded more than 459 programs with annual budgets ranging from $3,000 to $55,000. The staff of USC Civic Engagement takes up residence in COMMUNITY HOUSE, widely believed to be the sixth-oldest home in Los Angeles. The Los Angeles Cultural Heritage Commission designated it Historic-Cultural Monument No. 103 in 1972. Time magazine names USC COLLEGE OF THE YEAR, primarily based on the level of community responsibility and involvement. The USC GOOD NEIGHBORS CAMPAIGN passes the $1 million mark. To date, the drive has raised more than $16 million to support community organizations that are partnering with USC to put children on the pathway to college, make streets safer for families, and offer activities and programs aimed at improving the health and well-being of residents in the neighborhoods surrounding USC campuses. USC’s FIRST ASSOCIATE VICE PROVOST OF COMMUNITY RESEARCH INITIATIVES is appointed. USC begins to invest $1 billion to improve the university park campus, including the USC VILLAGE. This is the largest development of its kind in the history of South Los Angeles expected to bring new businesses and 12,000 jobs to the neighborhood.